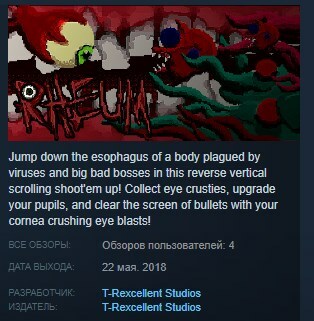 Travel through a fleshly vessel, as an eyeball, collecting rheum [eyeball crusties] to grow stronger in your fight against the infection plaguing this.......body. Collect eye crusties, upgrade your pupils, and clear the screen of bullets with your cornea crushing eye blasts! Good ol´ fashioned cheat codes!